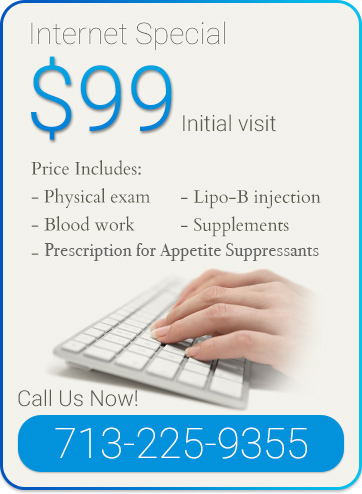 Houston Weight Loss Center offer the latest advances in bariatric medicine. Our medical weight loss clinics use a combination of prescribed medication, weight loss supplements, lipotropic injections, low calorie diets and behavioral modification. Losing weight is never easy, but our comprehensive weight loss program we will offer you all the tools you need to succeed. This program begins with a medical evaluation by one of our nurse practitioners (NP’s) or physician assistants (PA’s). The evaluation includes a private weigh in, and a body composition analysis which gives BMI and estimates body fat percentage. The evaluation also includes a detailed medical history, physical exam and blood work (CBC, comprehensive metabolic panel, lipid and thyroid panel). The NP or PA will discuss, in detail, the recommended weight loss program. In addition to prescribed medications and supplements, diet and exercise recommendations will be given. The initial follow up visit is usually scheduled at 2 weeks and then every 4 week thereafter. At each visit you will have a private weigh in, and body composition performed. You will meet with an NP or PA to discuss all aspects of your program including efficacy of prescribed medication, and diet and exercise compliance and/or challenges. At each visit you will be educated and given tools to help you continue or maintain your weight loss. We understand that “keeping the weight off” is a challenging obstacle for anyone who has lost weight. We can continue to see you on an as needed basis after any weight loss program is completed. Leave it to the professionals at Houston Weight Loss Center to guide you in your new healthy lifestyle.